This entry was posted in Other Authors and tagged ale, Alon Shalev, analogy, At The Walls of Galbrieth, author, C.S. Lewis, characters, dragons, dwarves, elves, epic fantasy series, epic movie, Ivy League, Longbottom leaf, Lord of the Rings, LOTR, meaning, plot, professors, quests, social justice, symbolism, The First Decree, The Hobbit, Tolkien, Tourmaline Books, Unwanted Heroes, values, World War 1, Wycaan Master Book 1, You Tube video. Thank you so much for posting this- it’s fascinating viewing. 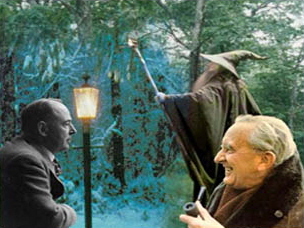 Tolkien’s letters are also really great for getting a glimpse of his writing process and how he himself saw the Lord of the Rings and its significance and value. I’m glad you enjoyed it. I went to the library and took out the book about the Inklings – I had no idea. I have run a critique group for the last seven years. Just spent a half hour on your blog. You write some great posts and reviews. Let me know if you would like to post something here, or if you are looking for an epic fantasy novel to review.